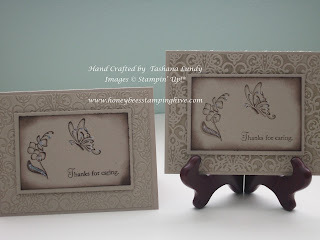 Today I am sharing a couple of cards that I CASEd from Dawn Olchefske. I did, however, change the stamp set that I used. I love this technique with tone on tone. It can also be done with different colors. I used my VersaMarker to make a shadow on the images. I think that is a technique called Ghosting.